Landmark: 16/C-3, Green Crest , Amritvan Complex, Dindoshi , Mumbai – 400 063. 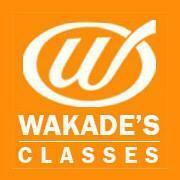 Wakade Classes conducts classes in Class 10 Tuition, Class 11 Tuition and Class 12 Tuition. It is located in Sharma Industrial Estate, Goregaon East, Mumbai. It takes Regular Classes- at the Institute.